According to the Paris-based dealer Dikran Kelekian, from whom Freer acquired it in 1903, this jar was excavated from a Persian tomb and was two thousand years old. 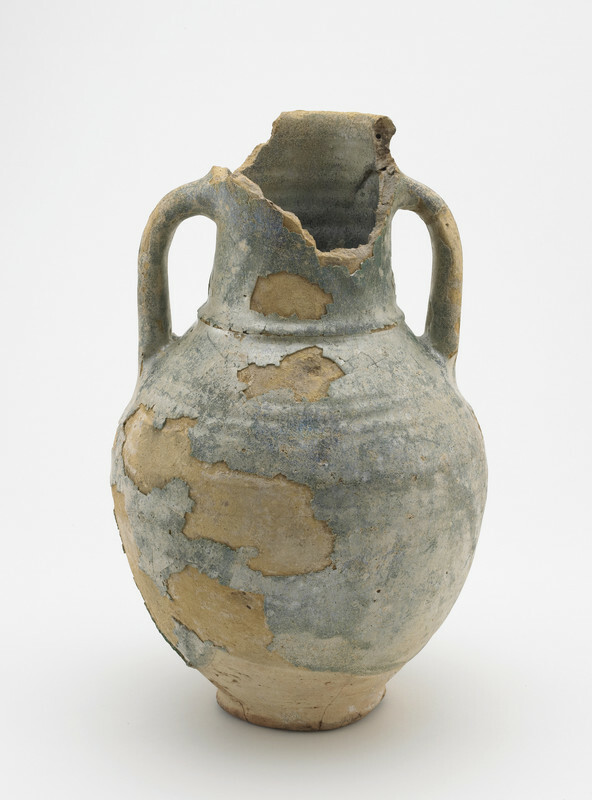 Despite its advanced state of archaeological decay, the vessel, which is actually an example of Syrian Raqqa ware, dates to the medieval periodthe eleventh through the thirteenth century. For Freer, who had only begun to acquire Near Eastern ceramics in 1902, the iridescent, highly degraded turquoise glaze and the rough surface texture of this vessel was one of its chief attractions. He went on to amass a significant collection, many of which were prominently displayed in the Peacock Room in Detroit. "Jar," in The Peacock Room, Freer Gallery of Art, Smithsonian Institution, Accession No. F1903.227, Item #3127, http://www.peacockroom.wayne.edu/items/show/3127 (accessed April 19, 2019).